AWWWW NEW YORK. Such a wonderful place! So much culture and SO MANY people. I love going but I also getting to come home! My husband had never been so we were the “typical” tourist over the long weekend! We stayed at the Double Tree In Times square and here is a summary of everything we did! 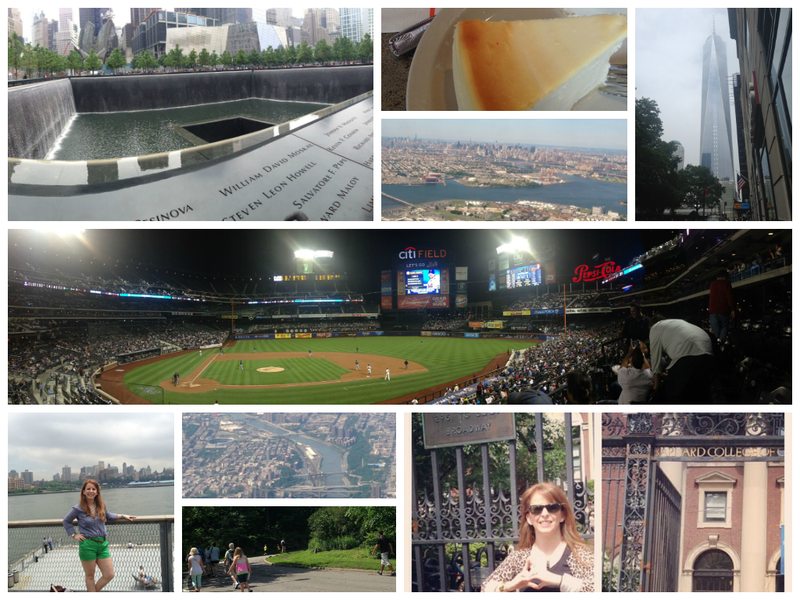 Thursday- Walked around times square… Ate lunch at Carnagie Deli [HUGE sandwiches] and tried out a pub and went to the mets game! Friday- The weather was all over the place but we headed for Wall Street and to the Pier area. Got to the One world Trade Center, so amazing but so sad reflecting on how that day changed our lives forever. Then we went to the Pier area! Sat and had a drink with a wonderful view and then ate lunch at a food truck park! We tried @shortysonwheels and it was AMAZING! Then we headed back to change for dinner and a broadway show! We ate at Carmines and saw Of Mice and Men with James Franco, Chris O’Dowd and Leighton Meester. SO MUCH FUN! Saturday- We got up and went to see Barndard College at Columbia Univeristy where AOII was founded! Then walked to see Central Park! We went to meet my cousin and stopped by Radio City Music Hall and 30 Rock. We met up with my cousin and ate lunch in her neck of the woods then ventured to see the Empire State Building. Then ventured for some Juniors Cheesecake! After that she left and we decided to see an off Broadway show called Avenue Q…. HILARIOUS! Of course we were starving afterwords so we went to a hole in the wall to get some true NY Pizza…. MY FAV! I wore my Fitbit on the last day and we walked of 25,000 steps and 10+ miles! SO CRAZY. We loved it and hope to visit again soon! Below are a few fun pictures! That sounds like so much fun, Lauren. 🙂 Believe it or not, we’ve never been to NYC. We definitely want to do that sooner or later. I’ve always heard people talk about the Carnegie Deli. Glad you got to go.